We Have Continually Grown By Providing Quality Deals At Low Prices. Fair Pricing. Since it is Pre-Owned; may show signs of use. We carefully inspect each used item to make sure have minimal or no scratching. Eclipse 4GB MP3 Music and Video Player-brand new. Condition is New. Shipped with USPS First Class Package. New Finis Duo Underwater Bone Conduction Audio MP3 Player Black/Acid Green. The Duo™ supports unprotected MP3 and WMA files. The included USB magnetic dock allows for universal data transfers and charging. Capacity: 4GB FM radio: 87.0MHz - 108.0MHz Support MP3 Record format: WAV High resolution, backlit screen 3.5mm audio jack Built-in microphone, support voice recording Support multiple languages and music modes High Speed USB Data Transfer -- USB 2. Trending at $7.69eBay determines this price through a machine learned model of the product's sale prices within the last 90 days. RARELY USED, HAVE MINOR SCRATCHES. Enjoy your music, video and pictures on a 1.8 in. display with bold, full-color graphics with the RCA 4GB Video MP3 Player. It includes software to make it easier than ever to manage your music, pictures and videos. It supports MP3, WMA, WAV, FLAC, APE and OGG music formats. CJX601 4GB MP3 Music Player is your good music helper. With its small size and fashion design, you can take it anywhere. Its clip design makes it portable and easy to carry when doing sports. Trending at $15.97eBay determines this price through a machine learned model of the product's sale prices within the last 90 days. Polaroid PMP80-4 4GB Music MP3 Player. Music Player. User manual. Model: PMP 80-4. Built-in sports clip. Polaroid 4GB MP3 Player Model: PMP-182-4. Condition is Used. Shipped with USPS First Class Package. Sandisk Sansa e260 4GB MP3 PLAYER-MUST SEE! Sandisk Sansa e260 4GB MP3 PLAYER-MUST SEE!. Condition is Manufacturer refurbished. It’s in excellent condition clean no scratches or dents just like new The USB CABLE CHARGER AND EARBUDS ARE BRAND NEW IN THEIR FACTORY SEALED PACKAGING. HAS FACTORY PRESETS SOME MUSIC -a Lil’ Monsta video-all Factory presets. Genuine SanDisk actual Manufaturer REFURBISHED. It’s MANUFACTURER REFURBISHED BUT AFTER THAT NOT UNWRAPPED OR USED BY THE CONSUMER. It’s in a factory sealed wrapper. It’s got a microSD CARD SLOT SO YOU CAN MAKE LARGE AMOUNTS OF MUSIC FOR THIS PLAYER. Shipped with USPS First Class Package. 4.5 out of 5 stars - Sandisk Sansa e260 4GB MP3 PLAYER-MUST SEE! 270 product ratings270 product ratings - Sandisk Sansa e260 4GB MP3 PLAYER-MUST SEE! Memorex mp3 player MMP8640A 4GB - Rare! Super rare jewel. In good working condition! This feature-rich model will let you listen to your favorite music and radio stations, watch movies or capture your own pictures and videos with your friends. The portable MP3 video player has a built-in radio and speaker. Craig MP3 Plus Video Player 4GB. Condition is New. Shipped with USPS First Class Package. MP3 Player. All features and functions work as designed. Has room for up to 1200 songs. The USB cable can also be plugged into your computer to transfer music to / from the MP3 player. Use any standard headphones / earbuds with a 3.5mm jack. Model #M6204. Built-in FM tuner. Includes earbuds and USB cable. Condition: This item is in used condition but looks very nice. A few years back I was the recipient of my Uncle Harold's STUFF.and the list goes on and on. Will try and list as fast as I can get to them. 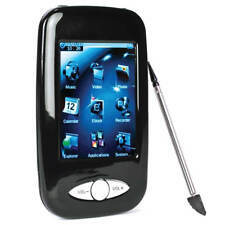 SealedCraig 4GB Touch Screen MP3 Video Player. SanDisk Sansa Fuze Black 4 GB MP3 Media Player FM Radio. Condition is Used. Shipped with USPS First Class Package. The back is sticky and has wear. Item is tested and comes with original charger. The item overall shows heavy wear, but is functional. New, still in package. Sylvania MP3 Player Model SMPK7954 Zoom the second picture for specifications. Enjoy! THIS SALE IS: PLAYER, USB CABLE AND STYLUS PEN FOR TOUCH PAD(COLOR OF STYLUS PEN VARIES). No earphone or other accessories. HAVE MINOR SCRATCHES. NO WI-FI CONNECTIVITY. Works perfectly. This mp3 is small and very convenient for running or traveling. It’s much easier to maneuver than a large cell phone. And with its smart design, you can clip your Sansa® Clip player to your bag, pants or sleeves, allowing you to enjoy all the perks of an MP3—hands-free. Emerson 4GB Music Video MP3 Player Touch Screen Works Fine. ISound Works Fine but has to be plugged in doesn't seem to want to hold a charge. ISound plugs in with a usb cable type C. Condition is Used. Shipped with USPS First Class Package. For sale is a used Sansa Connect 4GB mp3 player. It is in good working condition. The usb cable is NOT included.i had to borrow one for testing. An MP3 player with 4 gigabytes of storage space should give you enough room to store several albums of music or dozens of audiobooks. 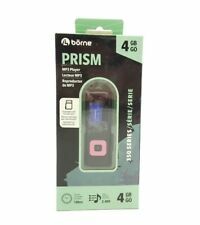 Several brands make 4GB MP3 players that are packed with many convenient features to make your listening experience enjoyable. You can find numerous player options on eBay. What are some features of these devices? Adjustable speed - You can increase or decrease the default speed at which your 4GB MP3 player plays music or audio files. Equalization - Equalizer controls allow you to adjust some of the more subtle aspects of your audio to make them easier to hear against background noise. Games - Some 4GB players include extra games you can play while you listen to music. Sleep timer - You can use this feature to put the MP3 player in a low-power state when you're not using it. What connectivity options are available in these MP3 players? Bluetooth - If you want to connect your player to another device to share music with it, you may be able to use Bluetooth to do so wirelessly. USB - Many 4GB MP3 players use USB 1.0, 2.0, micro, or mini specifications to connect with other devices that have the same ports. Wi-Fi - You can use a Wi-Fi network to connect your player to the internet or other devices that use the same network. Can you get used MP3 players? 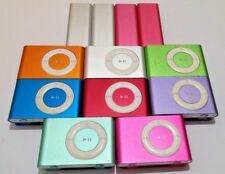 You can find a selection of brand new and pre-owned MP3 players with 4GB of storage on eBay. 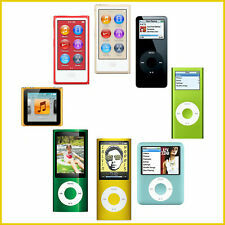 If you don't want to buy a new MP3 player, you can buy used versions of your favorite make or model directly. You also have the option to pick up a player that has been refurbished by the manufacturer. 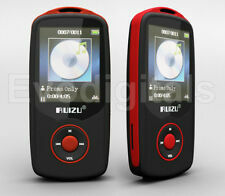 A refurbished MP3 player is intended to look and function like a new device.